One always collects too much stuff at a conference – mainly heavy paper stuff. On the morning of departure from Kyoto we had to sort through it all and make hard decisions. I brought my wheeled suitcase on this trip so I could put the heavy stuff in it, and carry light things in a smallish backpack. Last week, one wheel called it quits and went into the dreaded “drag me” mode. So… Plan B went into effect: light stuff went in dragging case, heavy stuff in backpacks and handbags. This was in the middle of a Saturday so we didn’t have to contend with commuters. We successfully made it through all the turnstiles and station passages and took the correct train to Tokyo. Yay for us! Arrival in Tokyo soon set us straight. Pouring rain. 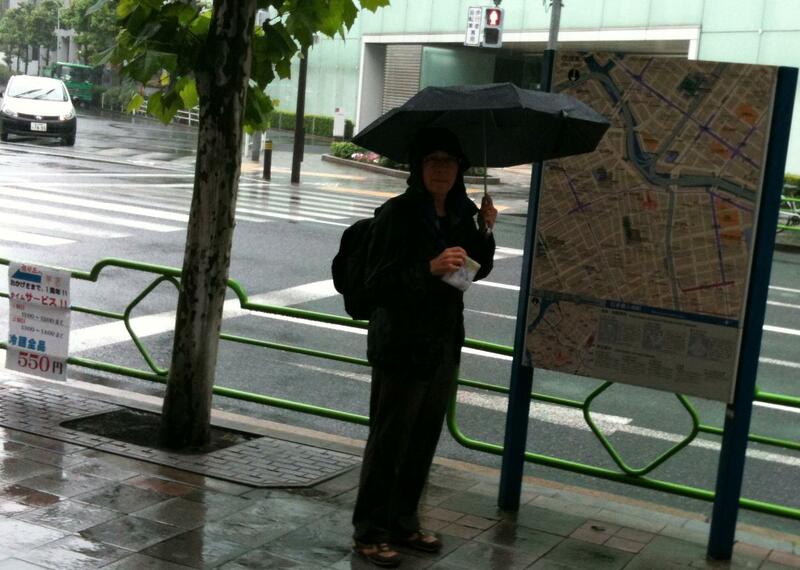 Use one hand for umbrella, back for backpack, shopping bag of conference proceedings in hand. Husband carries uncooperative suitcase plus his backpack and brolly. Every block or so we huddle under an overhang, pull increasingly wet map from bag, and try to figure out where to go. Those of you who have been to Tokyo understand that most street names are not visible on most maps, most streets are without name signs, and certainly the 2 rarely coincide. The good news is that a few main streets have “You Are Here” signs every block or two. We puddle-jumped in the desired general direction, maintaining admirable civility to each other even as the map got soggier and the bags heavier, until one of the signs actually showed our hotel nearby. At the hotel reception desk, we were so soggy-looking that the clerk handed us towels! In the room we found this device. It may be familiar to you, but it wasn’t to us. 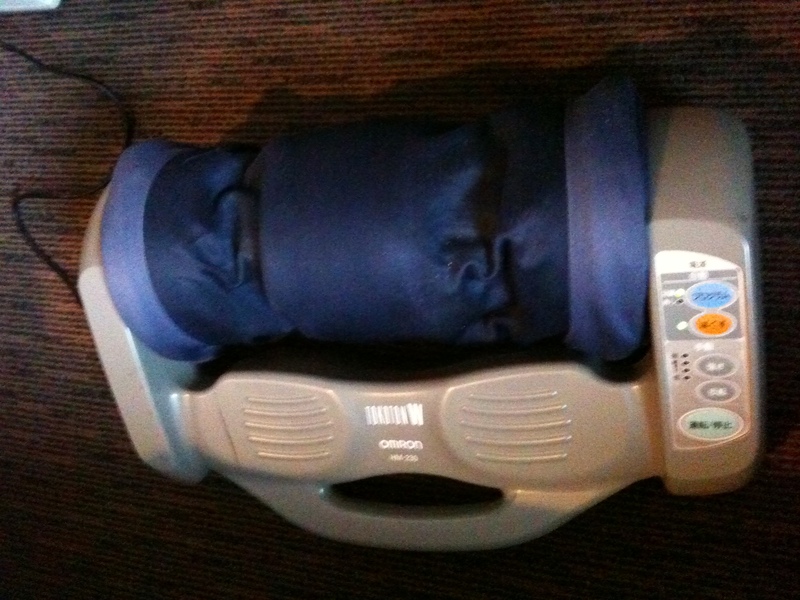 I thought it was some kind of vacuum until husband sensibly observed that there was no air intake. 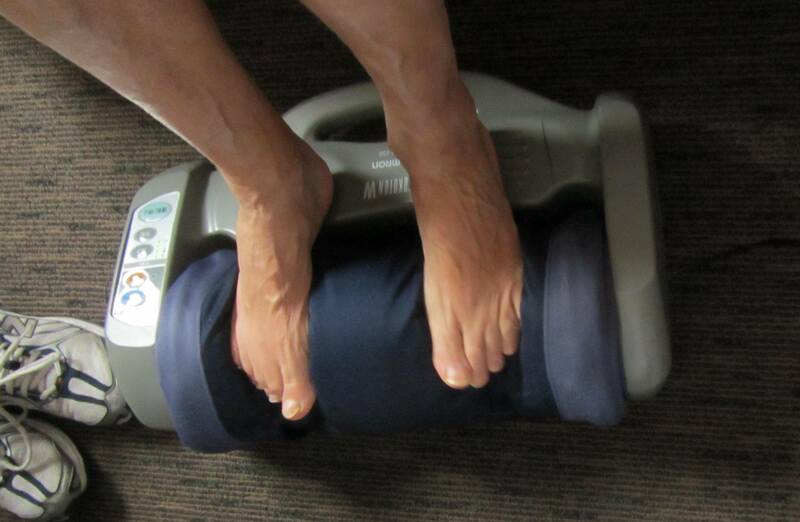 He studied it and studied and announced that he thought it was a foot massager. I advised him that he risked having his toes ripped off. But he plugged it in and it WAS a foot massager! Having had a tough day, we massaged our feet, explored the television offerings, went to the nearby convenience store for food, and returned to watch TV, drink beer and slurp instant noodles for the evening (AGAIN). Were the noodles any better there? Noodles are delicious anywhere when your feet hurt and it is raining outside.